*It is easy to assume that a persons’ motivation for writing a book is less than desirable. Especially if that person stems from a famous family. Everyone is seeking at least 15-minutes of fame, right? Perhaps. But as you read about the struggles and rearing of 33-year-old Zoleka Mandela, granddaughter of former South African president Nelson Mandela, those assumptions begin to melt away because, quite frankly, this girl’s got a lot of baggage of her own. We already know the struggles her grandfather endured, spending decades in a prison cell (an inadequate one at that!) on Robben Island; But now we get a visual on how the apple really does not fall far from the tree. That survivor spirit comes shining through. “By the time I was born, on 9 April 1980, my mother (Zindzi Mandela) knew how to strip and assemble an AK-47 in exactly thirty-eight seconds. 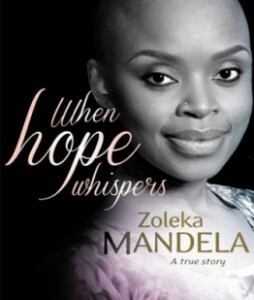 She was twenty years old, trained in guerrilla warfare and already a full-fledged member of Umkhonto we Sizwe (the armed wing of the African National Congress),” says the opening line to “When Hope Whispers,” as it describes her mother’s participation in violent struggle against apartheid. In the book, which recounts her family’s involvement in the fight against apartheid, Zoleka shares many stories. One of how she was smuggled into prison on Robben Island by grandmother Winnie Mandela before she was a year old so that her grandfather Nelson could see her. Another story told by her mother and grandmother of a time they said she helped her grandmother by hiding a hand grenade in her school bag, where police didn’t look, though she still saw her grandmother arrested. And still others, where she shares her struggles with alcohol and drug addiction, the loss of two of her children and her fight against breast cancer. In one poignant confession, Zoleka admits a pain she says she must live with forever regarding one child that was killed in a car accident. A breast cancer survivor, Zoleka, who had a bilateral mastectomy and completed chemotherapy in early 2013, recounts the experience. Video journals will also accompany “When Hope Whispers” and Zoleka Mandela hopes to encourage other cancer survivors.